Here's a figure I never would have thought about buying - but now Jeff Parker has me reconsidering that! 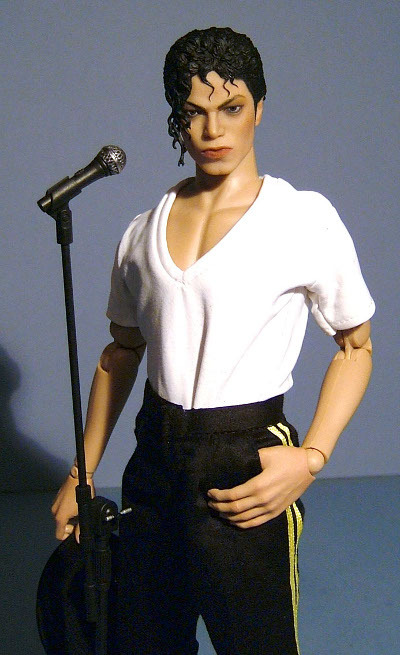 Tell us all about the King of Pop, Jeff! 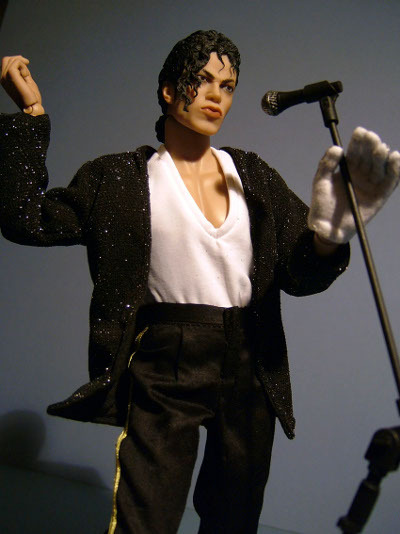 Now from Michael Crawford the King Of Toys to…. 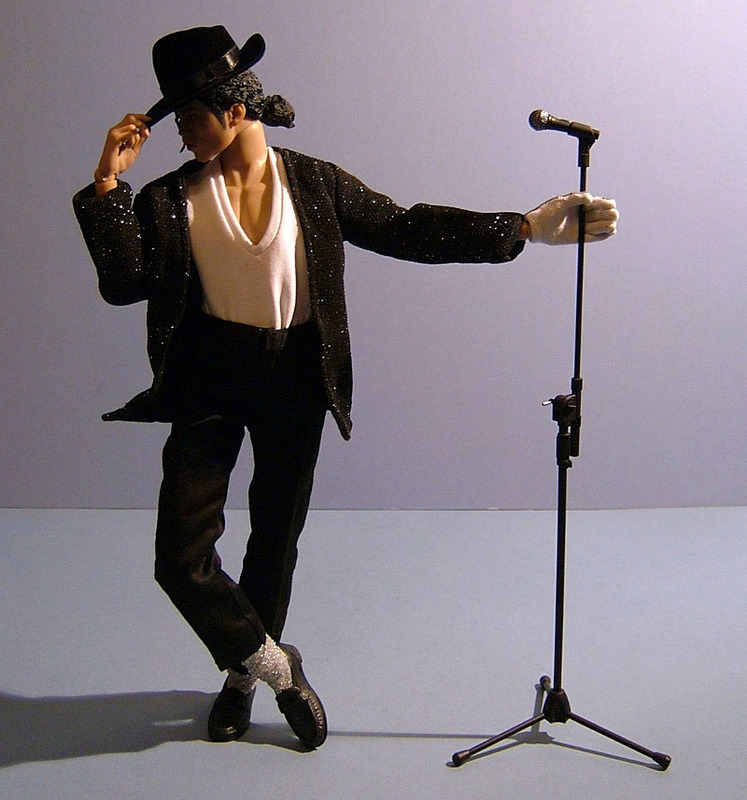 Michael Jackson, the self proclaimed King of Pop, it’s actually hard to think of a bigger Icon… OK maybe Jesus Christ pips him at the post (though I seem to remember a world poll being taken back in the late 80’s and MJ did actually come first!). Nonetheless a lot has happened to his career since he first rocketed to stardom with the Jackson 5… and he has hit the world wide headlines of the press many, many times, and not always for good reasons. But, whatever you think of the man, I would defy any of you to have lived his life and come out the other side unscathed, unaffected and ‘normal’ (whatever that is) that’s not to say I think you’d come out quite as ‘eccentric’ as MJ has, but you get my drift. He’s sold more records than any other artist ever. Period. With Thriller being the only album to punch through the 100 million plus in worldwide sales (though I prefer Off The Wall, which only managed 20 million, but what would I know). 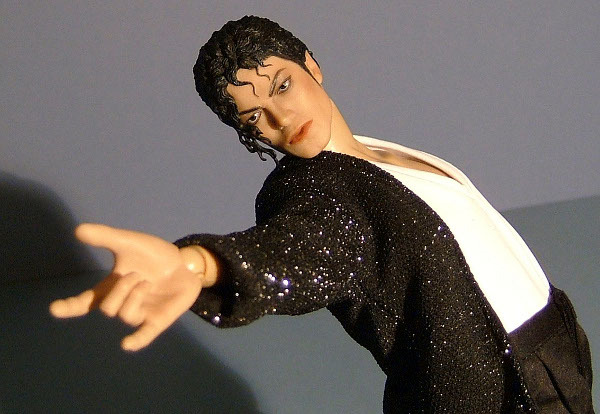 Over the years there have been a number of MJ dolls, figures and various other collectibles, but right now we’re looking at Hot Toys latest offering in their M-Icon range. And like the man, it’ll have people divided! The M-Icon range has a very distinct feel to the rest of the HT stable of packaging. 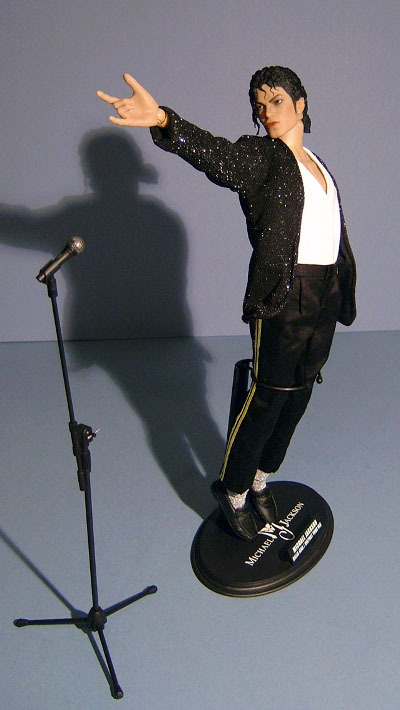 They are constructed of a hard board material, on this occasion finished in a silk black veneer with silver foil blocking and a stylised white-out photo of MJ in profile. The top right hand corner has a cool metal badge finished in a shiny polished steel effect (these have a small transparent sticker covering them so they don’t get scratched up in transit). It opens up to the left exposing a paper overlay with some pictures of the figure and a brief bio. This in turn opens to the left again to show MJ totally surrounded in a die-cut black foam, so he’s safe as houses, and should arrive in A1 perfecto condition. I like these boxes, visually they don’t blow you away to the same degree as some of HT others, but they are immaculately put together, sturdy and that foam offers great protection. Well, I just said MJ is one of the most recognisable faces on the planet, but it’s a face that has changed so very much. 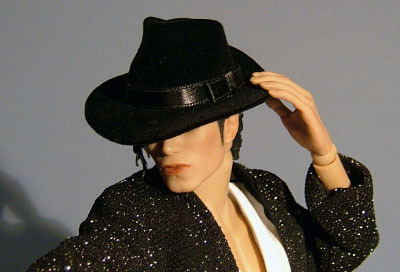 Just what drove him to want to alter his features so drastically over the years is a mystery, but here, it’s based on the Billie Jean HIStory Tour period of his looks. 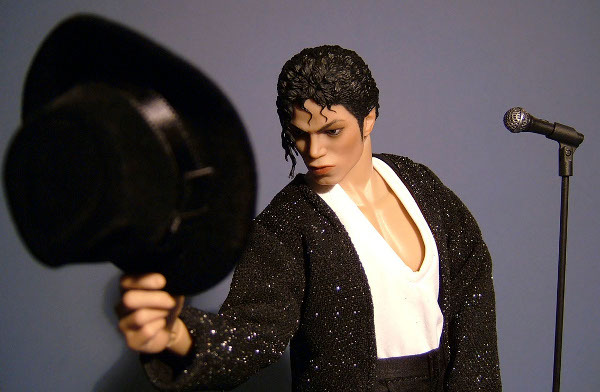 It’s a strong sculpt by Kang In Ae who has also worked on a couple of the other M-Icons in the range, namely James Dean and Marlon Brando, it’s definitely Jackson (or one of his better impersonators… lets face it there have been plenty). But for me there is something just off, it might be the choice of expression, as the pursed lips, mid dance routine look is so specific and quite extreme, that it’s a hard one to pull off from all angles. 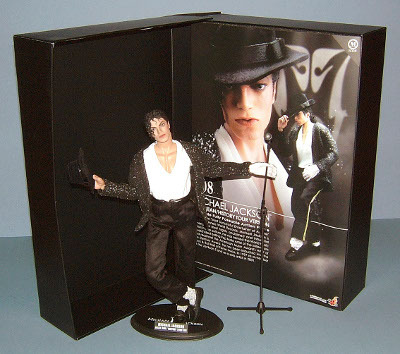 However I’ve been frequenting my usual hangouts on various 1/6th forums, and there are a lot of much bigger MJ fans than me out there, and they seem pretty happy with this figure. Perhaps some of this ‘happiness’ might stem from the fact they never thought they would see a figure of MJ done this well at all, and he is done very, very well. 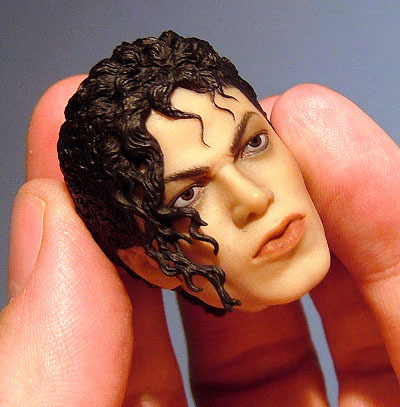 So even though It’s not 100% perfect, it’ is ‘as I said’ unmistakably Michael Jackson, the features are strong, capturing the shape of his head, angle of his nose (at the time it was based on) and arch of his brow. The eyes look determined, like he’s in deep concentration and the hair is just fantastic. It’s a difficult style to get right, but get it right they have, including the small ponytail and floppy bit at the side as separate ‘stuck-on’ pieces, but both pieces are attached well and the seam is all but invisible. We also get five extra hands giving a total of seven including the ones he has fitted. 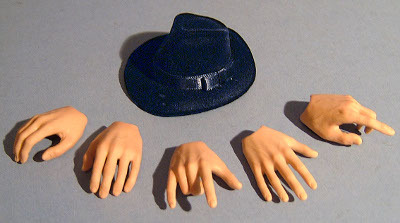 Fresh from the box he has his gloved left hand and finger clicking/brim of the hat holding right hand. 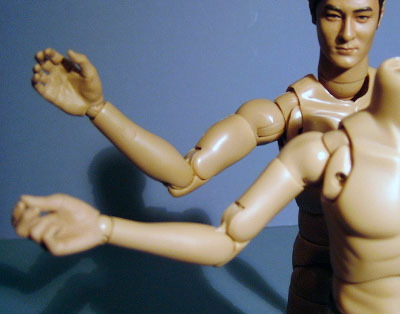 The extras are two in a relaxed position, a fingers splayed, a ‘Diablo’ lets rock for the right and a pointing/gesturing hand for the left, some of these are similar to the ones that came with Wong Ka Kui, but note only similar, not the same, as most of these are specific to this figure. 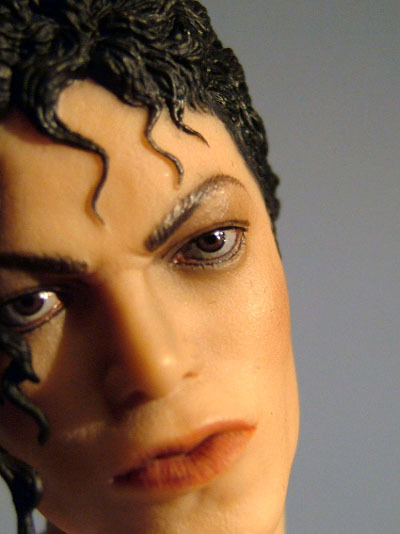 So, to sum up a very strong depiction of Michael from this period, but not quite perfection… at least to my eyes! Regardless of your views on whether this is a spot on likeness or not, then the paint app is definitely approaching perfection! Enhancing the finished look and detracting from any weaknesses there may or may not be in the underlying sculpt. The skin tone is smooth and even, showing nice blending around the eyes and cheeks. The mouth is picked out perfectly as are his eyebrows and glossy eyes. The hair is a fairly flat black colour, but the edges are super crisp picking out the few strands falling onto his forehead perfectly. So not a lot to paint here, but all carried out to the highest of standards! This figure showcases the all-new slim figured True-Type body, It displays all the articulation of the standard TT, but is sculpted and modified to suit characters with a leaner frame, some pics can be seen towards the bottom of this link. 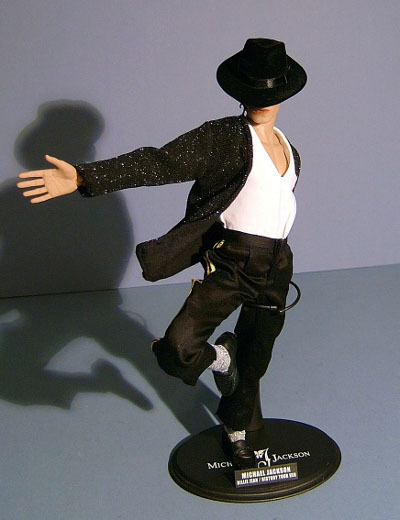 At the moment the TT is still the best mass produced base figure out there, and for MJ a well articulated body is an absolute must, as for all the records this guy has sold… and indeed set, he’s as famous for his incredible and innovative dancing as he is for anything else, so to do him justice he needs a base body that can pull this off. 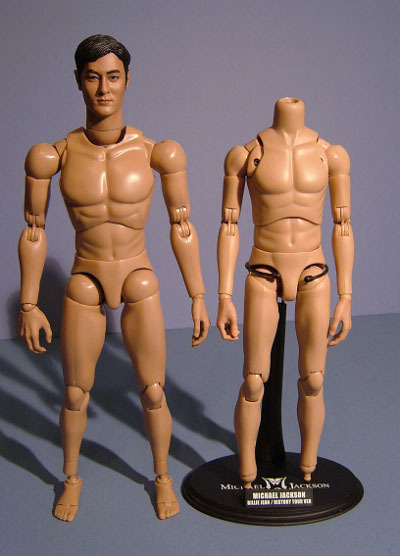 I’m glad to report the slim line physique is just as adaptable and poseable as the standard TT reviewed in the link above, so you’ll be able to pose him in just about any position Michael could achieve, and quite a few he wouldn’t want to. Michael is pretty light in the accessory department, but he still has a pertinent selection. You get the hat, which I kind of covered under outfit, but as it’s separate in the box it could also be considered an accessory, this is a very nicely realised piece which seems to be constructed of thin pliable plastic which is then flocked, a satin ribbon is then wrapped around the band, all in all it’s very convincing at this scale. It would be nice to see this quality translated to Indy’s hat… hell it’d be nice to see this quality transported to Indy full stop! We also get the five extra hands as described above, the classic HT stand emblazoned wit the Michael Jackson ‘logo’ and lastly a microphone on a tripod stand, this is again nicely put together and has articulated and jointed elements, it looks to be a re-use of the Wong Ka Kui (Live Version), but as I don’t have that one I can’t say for certain. So, not the strongest selection of goodies ever, but none too shoddy as well, and what we do get is of the usual exceptional quality! Now I freely admit I’m not that up on the outfits MJ has worn over the years, but by doing a simple Google search, this outfit looks pretty close to me. 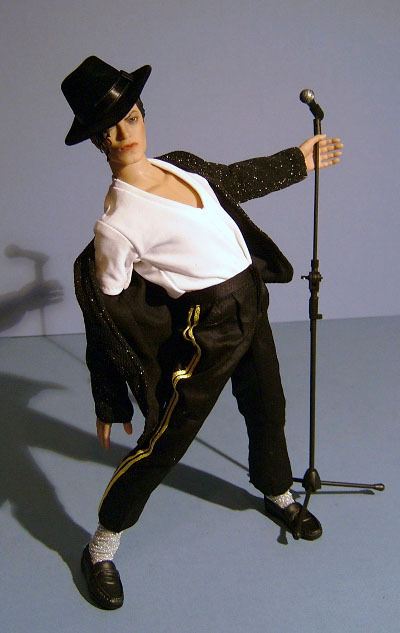 It consists of black loafer style shoes, silver socks/leg warmers, black pants with yellow piping, a white V-neck T-shirt, black sparkly jacket, a sequined glove and a black fedora style hat. The shoes are sculpted plastic but show plenty of detail, the socks are baggy around the ankle like his stage worn ones, so they slouch like leg-warmers around the bottom, the strange thing is the sock and shoes are joined. A foot seems to have been put inside the sock then fixed inside the shoe. 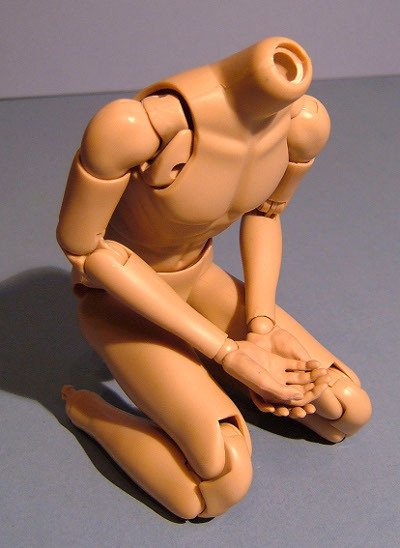 The peg on the ankle is more like the wrist pegs than the traditional ball-joint we’ve had so far, the sock that protrudes is very long (knee length) with an elasticised top so they don’t fall down. The pants are well tailored and are cut short (as he seems to favour) with a Velcro fly. It’s good strong Velcro and I haven’t had any problems with it coming open. His T-shirt has a low cut V-neck, of all the garments this is my least favourite but I think some might swap it out anyway as during the tour his shirt design seems to have been changed many times. I also feel that the fabric used is a little thick, making it seem more like sweatshirt material at this scale rather than thin cotton jersey. The jacket is a strange garment, I don’t mean this copy is strange, as HT have done a great job of mimicking the original in 1/6th, even putting a wire in the edging so you can pose it ‘mid dance move’. No, I mean it’s just a strange jacket, I know ‘stage wear’ is often more theatrical than ‘street wear’ and Michael has never been one for understatement, but this is like something your ‘I think I’m trendy’ Aunt would wear to a reunion disco! 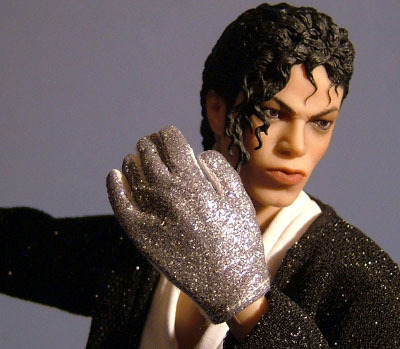 He also has his trademark sequined glove, this is an actual scaled glove rather than a sculpted hand, so it can appear a little oversized, however MJ really does have rather large hands, just not quite this big! 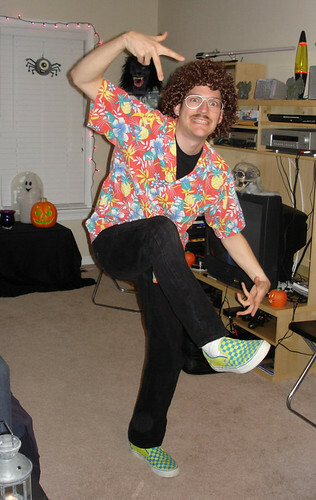 So, even though I think his choice of jacket is strange it hasn’t affected my score, as this is a very accurate copy. No, the only thing keeping this from a full score is the shirt, which isn’t bad at all, but could do with being a thinner material, apart from that this outfit looks faultless. 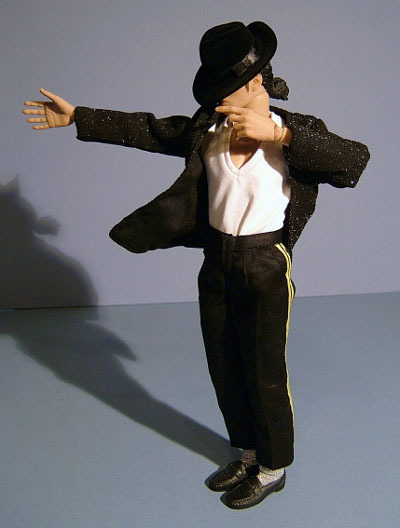 Hey, it’s a 1/6th MJ you pose however you like… that’s gotta be priceless… well to some anyway! That said, he seems pretty thin on the ground as far as availability is concerned, but you can find him on eBay for between $150 to $220. I based my score on a price of $150, but if you find yourself approaching the $200 mark, then you can knock at least 1 star off! This figure will undoubtedly liven up any display, as it’s just such juxtaposition to many of the mainstream ‘fan-boy’ staples of fantasy superheroes, robots and aliens. To me, it’s in many ways a more important figure than any Batman, Terminator or Stormtrooper, not because I think it’s ‘better’ or because I want it more (which I don’t) but because it’s a brave move and represents a popular cultural icon that was a huge part of the landscape in the late part of the 20th century and remains one at the start of the 21st! And if this art form is to grow it needs to start encompassing a far greater variety of subject matter, therefore bringing a far larger audience/customer base into it’s fold. So although this figure isn’t perfect, it marks another step towards making 1/6th collecting a more mainstream affair which will give us a much more diverse selection of viable characters, be they real or fictitious, and if/when that happens my ‘fun’ barometer will go off the scale. 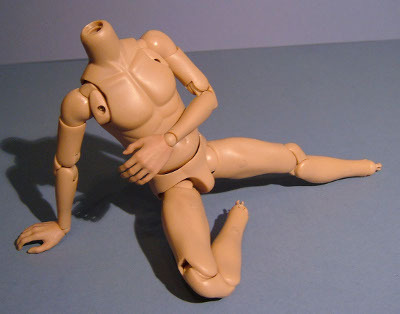 As it is, I still think you’ll have a ton of fun posing this guy! There’s no getting away from the fact that this is a top quality figure, but it’s a figure that will divide collectors for many reasons. However for those that are fans, this fires on virtually all cylinders, the base body is a modern classic (adapted especially for this release), the outfit is pretty much spot on, the accessories are solid and the sculpt is unmistakable… not perfect… but hey, it couldn’t be anyone else! I can’t find it with any of Michaels sponsors apart from Forbidden Planet in the UK where he’s �129.99, so it looks like it’s time to hit eBay or pester your local ‘specialist’ shop to get it in.